As you can see, the number of boats arriving daily to the main port in Venezuela for food imports, has increased significantly from the lows that I reported in April reaching levels between 8 and ten ships per day, something not seen since January. This is welcome news, even if it is clearly insufficient. 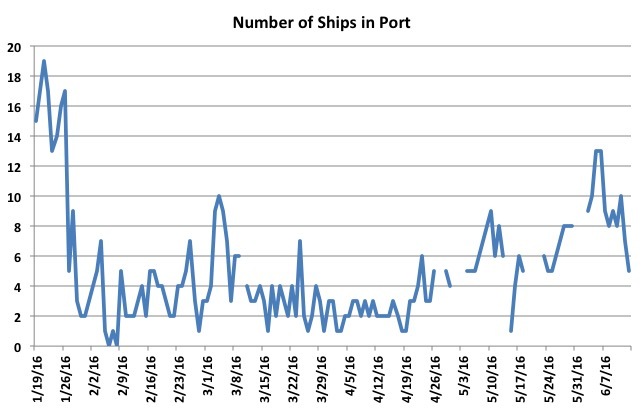 Recall that last year, the average number of ships in Puerto Cabello was typically 14 to 15 each day. Moreover, you have to understand that there is a new mindset in Venezuela: that of extreme scarcity. Even those that have little money for purchases are hoarding something at home. Everyone has something in life that you feel you need no matter what. Thus, whether it is soda, toothpaste, sanitary napkins or simply milk for your baby, the scarcity mindset drives people to hoard their favorite foods. The results is that the cabinets and closets of the people are full of many of these items and it will take over-importing, something we are not even close to, in order to make this mindset disappear. The consequence is that as the scarcity levels have increased, higher imports are simply not felt by the population.Meanwhile, the Government remains in control of what may be or not imported, while at the same time increasing its power over distribution channels. Its latest invention, ironically called the CLAPs, are committees to distribute food to only Government sympathizers, thus creating an apartheid in which if you don’t sympathize with the Maduro administration, there will be no food for you. It does not get more fascist than that! Meanwhile, scarcity is so bad, that the Government now has to resort to accompanying food trucks with security, lest they be looted by hungry people when trucks stop. Sometimes they don’t even have to stop, they are ambushed by people at the entrance of towns as they head to supermarkets and quickly emptied from their goods. In places like Cumana, stores have been looted and many of them have no plans to re-open, aggravating the problem. Meanwhile at the OAS, Venezuelans became hopeful that some international pressure could be applied on the Maduro Government, something that has not worked in the last seventeen years. The Maduro Government masterfully played the diplomatic game, proving once again that countries have no principles, only interests. Even recently elected Mauricio Macri of Argentina, found his personal interest in having his Foreign Minister become Head of the OAS more important than the fate of Venezuelans, backing out of strong statements made in the exuberance of his Presidential victory. To say nothing of the US, which decided to push for the mediation route, a path that is only meant to delay the feasibility of a recall vote against Maduro in 2016, thus guaranteeing that Chavismo, even if it has to get rid of its current bus driver, will rule over Venezuela until 2019. And the opposition was partially to blame. It really was not playing international diplomacy at the same level, but it also accepted some initial gambit for negotiations, led by a bunch of former Presidents, who are not only pro-Chavistas and which have little significance in their own countries, but whose role as mediators is financed, funded and toasted by Maduro. Of course, the OAS’s task was difficult from the beginning given the large number of fairly wealthy Caribbean countries that receive cheap oil from the Maduro administration and have sold their soul to the Chavismo Devil (not related) for years. As for the recall, the many manuevers by the Electoral Board are so incredibly biased that their pro-Chávez members should one day be tried for the wholesale violation of the people´s rights (and their pensions rescinded). Not only have the timetables established in the law not been respected, but rules have been made up on the fly to make the recall even vote more difficult. From requiring 1% of the voters for each State, rather than 1% of the voters nationwide, as clearly stated by the law, to arbitrarily voiding 600,000 signatures for the recall, to allowing people to withdraw their signature (something that less than 6,000 people out of 2.1 million took advantage of), the whole process has been shameful and should be enough justification for the OAS to do something. The latest ruse? After signing the petition for recall, people have five days to go to the Electoral Board and ratify that they signed the petition using their fingerprint. Now, in a country where all supermarkets are now armed with fingerprint machines to restrict the purchase of price – goods, the Electoral Board came up with three hundred machines to have the remaining 1.352 million people ratify their signatures. Even more shameful, the distribution of machines is as efficient and biased as the Government’s food distribution network. For 241 municipalities with 600,000 people who signed the petition, there will be zero machines to ratify their signatures. At the same time, 64 municipalities with 21,000 signatures will have all of 100 machines for people to ratify their signatures. The most ridiculous case is the town of Ocumare de la Costa, where there will be all of four machines to service the 264 people who signed the petitions. Of course, municipalities like Chacao, Baruta and El Hatillo, with thousands of signatures will have none, zilch, zero. Only around 200,000 people are needed to ratify the recall petition, but each state will need 1% of its voting population. Thus, the task is made quite difficult by restricting the number of fingerprint machines. Fascist hoodlums is what the four pro-Chavez ladies at the Electoral Board are! And so it goes…as this happens, Venezuelans get distracted by stories about cemeteries where the tombs of former Presidents are desecrated, which has been happening since even before Chávez took power in 1998, but which creates and outcry and diverts attention from the rapid, vertigo-inducing deterioration of the quality of life in Venezuela. As the Minister for jails, released prisoners to protest in favor of Maduro, there were two kidnappings very close to my family, including one nephew. But the police is too occupied guarding food trucks and protesting prisoners.